Key Point: Being vocationally challenged is another way of asking what we are called to do. Let us not become stuck in this endless cycle. This week, I propose that we do not need to elevate "calling" or "vocation" as a form of activity to be done. Instead, what is most important is cultivating our capacity and ability to listen. Perhaps, when we listen well, we will avoid letting our vocationally challenged posture become an end in itself. When I was at Regent College, one of the most interesting terms I heard was "vocationally challenged." Next to the other three famous words "I Don't Know," fellow students and staff used "vocationally challenged" whenever they were asked about what they wanted to do with their lives. A friend of mine noticed that there were two groups of students. The first group came with a keen sense of calling that once they graduated, they would enter into ministry so and so. The second group was a little more common: those who are using theological education as a way to find their calling. I countered with a third group: those who tried but still failed to find what they wanted. From my many encounters, I realized that students often come to Regent College thinking they can find answers to their spiritual search or theological learning. Instead, they leave with more questions. In fact, they will leave with more expertise to ask the very same questions in a more savvy manner. They become more confused. Like Humpty Dumpty who had a great fall, after a few years of de-constructing old theologies and archaic structural frameworks, they are at a loss on how to put them all together again. I can testify that after graduating from Regent, we are more equipped with more ways to ask the same questions compared to when I first started. For example, instead of saying "I am equipped to serve God," we become living persons who are able to cultivate "intelligent, vigorous, and joyful commitment to Jesus Christ, His Church, and His world." My Regent training tempts me to ask: What does that mean? Perhaps, it means the who is more important than the how-to. Perhaps, it means it-doesn't-matter as long as Christ matters. Perhaps, it means being open to what God can use us to do. 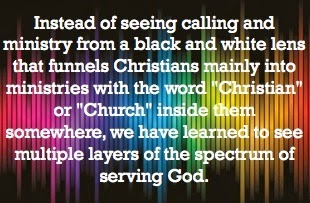 Instead of seeing calling and ministry from a black and white lens that funnels Christians mainly into ministries with the word "Christian" or "Church" inside them somewhere, we have learned to see multiple layers of the spectrum of serving God. Black is no longer black. White is no longer just white. Even grey is not always greyed out. They all have various grades and shades. Just like the questions that spurred the students' quest for answers, a typical Regent College alumnus learns to ask more questions in more fascinating ways! A vocationally challenged student may be poor in getting answers but he/she is certainly enriched with the ability to ask brilliant questions about vocational challenges. Ha! Paying so much money just to learn to ask questions? That is a tough way to justify a theological education. Having said that, I soon learn that a theological education is not just about reading books, writing papers, or paying through our noses to get their piece of qualification. It is also about being spiritually directed. For if we do not know about ourselves, how can we honestly lead others? It is a journey from theological information to spiritual formation. It is sensing the Spirit in all we do in the process of living transformed lives. This we do with the theological wealth of Regent professors; the gentle and intentional spiritual guidance by some; and the continued discovery of self and our role in the communities we serve. Past and present faculty members have drawn in many students with their renowned reputation on teaching vocation and faith@work. We have Dr Paul Stevens whose name is synonymous with marketplace ministry, faith in the workplace, and theology of work. 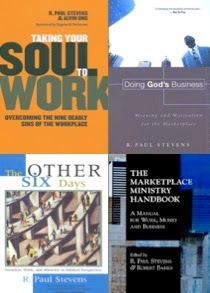 Now a "Marketplace Ministry Mentor," he has written books such as "The Complete Book of Everyday Spirituality," "Marketplace Ministry Handbook," "The Other Six Days: Vocation, Work and Ministry in Biblical Perspective," "Doing God’s Business: Meaning and Motivation for the Marketplace," and recently, co-authored with one of my friends in "Taking Your Soul to Work." 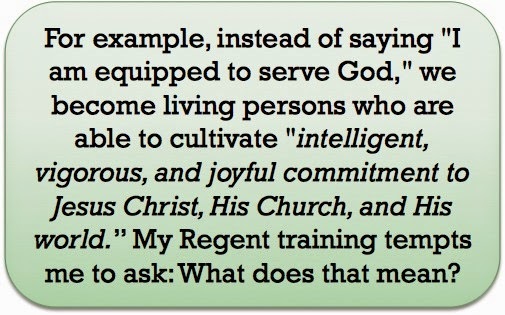 I know of many, especially from Asia, who had come to Regent to study primarily because of Stevens's work. I remember those sessions I had with him, to help clarify what I wanted to do. Often, the answers to where one seeks can be found in the questions mentors ask. Then there is Dr Bruce Waltke, whose book about "Finding the Will of God" continues to be a powerful influence to guide us in our vocational search. Calling it a "pagan notion," he dispels the fallacy of thinking that we can find a magical and specific "God's will" for ourselves within the sacred text. A respected biblical scholar, Waltke shows us that the way to finding God's will is not to look for divine signs but to encounter the divine God. This man of God has spent many years digging deep into the Hebrew scriptures, and sharing his wealth of knowledge with many, blessing people not just with his learning but also with his own life. Those of us who have interacted with Waltke will know that the theological knowledge is one thing. It is the person behind the knowledge that truly makes the theology alive. Personally, a key reason why I came to Regent College was because of Gordon T. Smith's "Courage and Calling." Used as a text in a Bible class back in 2001, I was captivated by the way Smith connected our search for meaning and significance with the more important task of seeking to know God first. Seek the Giver, not the gifts. Seek God, not the gods of this world. Seek the Caller, not the call. Know yourself. Ministry wise, there was the gentle guiding voices of Eugene Peterson, Darrell Johnson, and the President of Regent College, Rod Wilson, to name a few. I still remember Wilson saying to students unabashedly about his own understanding of calling: "I still don't know." Well, he knows more than us for sure. Enough to recommend one of the best books about vocation: Parker Palmer's "Let Your Life Speak." We need less of being informed and more of being unformed. Just like going on a spiritual retreat, many people may be thinking in terms of what we needed to do but fail to recognize the other equally important task: what we needed to undo. There is no way we can fit new things into a house full of old stuff. For me, one of these things to be undone is academic pride. The ivory tower syndrome is strong in institutions that people call "higher learning." Two words help me dislodge the accumulation of pride: So what. Listen not simply for the things that we want to hear, but also for what we most needed to hear. That is why one desert story continues to be popular. Abba Moses gave this advice to monks desiring to know what to do: "Go, sit in your cell, and your cell will teach you everything." It fits the monastic practices of silence, poverty, obedience, and chastity. Above all, it sharpens our listening skills and spiritual awareness of what God is saying. It fine-tunes how our hearts are listening. Ever wonder how Jesus was so in tuned with God? He prays a lot. He listens a lot too, that he can hear without any doubt: "YOU ARE MY SON, TODAY I HAVE BEGOTTEN YOU." The essence of our vocational activity is deeply connected to our sense of vocational integrity. The effectiveness of our working is tightly knitted to our sense of God working within us. The believing and the behaving are joined to our sense of belonging to God. That is why Christian ministry must never start with the ministry per se. It begins, ends, and continues always with Christ as the centerpiece of Christian spirituality and ministry. How we mature in understanding our vocation is proportional to our ability to listen. How well we listen will help us draw from the right resources. Then we can move forward boldly to act on what we have heard. We can do so many things, say so many words, and accomplish so many things, but still come up short if we fail to listen well. That is why many ministers and well-intentioned servants of God burn out. For in the haste to get things done, we may miss hearing the still gentle voice of God saying: "Behold Me. Come and spend time with Me;" "Come My child, rest in Me; "Come and see what I am doing." Another problem is anxiety. If we act less according to our anxieties and listen more to God speaking, we will hear more and more of seeking first the Kingdom of God and His Righteousness. Then all the things we care or worry about will be added to us. What does this mean? For one, if we able to discern what we need to do, we avoid doing things we do not need to do. Listening well means we do not waste gas making wrong turns. We do not overcook our garlic and onions with our rapid heat. We do not commit the error that Bonhoeffer wisely pointed out, that it is of no use running quickly in the opposite direction when we are on board the wrong train. If we spend less time in seeking out answers to conventional questions, and start to let questions probe ourselves out of superficiality, we are on the way to clarity, conviction, and Christ-centered growth. More importantly, we need to be less fixated about how-to methodologies, and more adept at asking: "What am I hearing?" Sometimes, the reason why we are not as authentic as we like to be is because of our inner fears and insecurities of not knowing who we are. We hide beneath the books of biblical knowledge. We let our titles and positions distract people from knowing the person behind the titles and positions. Our failure to know ourselves may very well be our failure to know God intimately. We mistakenly assume that great knowledge of God gives us a ticket to the heart of God. For it is one thing to know about God. It is yet another to know and to experience God. When searching for our own calling, sometimes we tend to be so caught up in what we need or want to do, that we fail to question ourselves about truth. 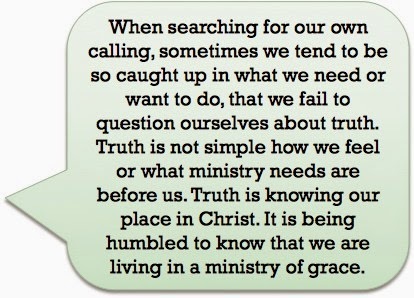 Truth is not simply how we feel or what ministry needs are before us. Truth is knowing our place in Christ. It is being humbled to know that we are living in a ministry of grace. It is also being willing to acknowledge that truth is often found in the paradoxes of life. Like the paradox of ministry and service. We are neither dispensable nor indispensable. The more we think we are indispensable to our ministries, the more dispensable we are. In some strange way, the reverse is also true, that the more dispensable we feel, the more indispensable the role we play. When I was managing a group of engineers years ago, I remembered telling my subordinates that there is no such thing as a permanent job, even for those who consider themselves "permanent staff." With volatile business conditions, it is very common even for million dollar projects to be mothballed and long-time staff to be retrenched. Truth is not in terms of getting and holding down a permanent job. For if that is so, losing a job can be devastating not just to our wallets but also our spirituality. Moving beyond vocational challenges means listening well. Listening well means listening to what is truth. God has given us one mouth and two ears. Surely, we ought to listen doubly hard. We are called to listen first regardless of what we are doing or not doing. We are called to pay greater attention to the voice of God speaking to us in the midst of our activism in communities, biblicism in churches, or criticisms of secular society and worldly culture. We are called to be who God has created us to be. There is no higher calling than to be called to serve Christ in the power of the Holy Spirit. What we do is not the important thing. In whose Name we do is.